never been worn vintage high heel red rubber boots, made in france, they look exactly like barbie shoes. 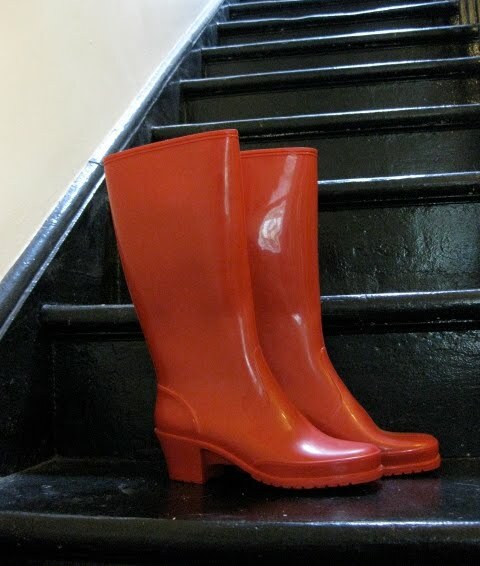 good for those rainy days when you still want to look slutty. vintage pyrex! in excellent like new condition. their snowflake pattern has always been one of my favourites. vintage deer figurine! i've always wanted one of these. made in japan. vintage heads!! i've seen these before, but never in a pair. these are in excellent condition too! vintage woven clutch with seafoam green plastic! never been used, tag still attached. i dragged back about 70 lbs of luggage from winnipeg. most of it was fabric. more pictures to come. but i also scored some pretty nice vintage finds! during my last day there, i must have walked at least 20km, going from salvation army to goodwill to MCC's. everything is so far apart there, and the bus routes were so confusing, i would have killed for a bicycle! thank goodness for GPS on my phone. those rain boots are killer, the deer is perfectiona and weird,i just seen one of those heads just yesterday at vv.